Your children are growing up and they are starting to learn and take on more responsibility. Part of growing up for any child is learning to help around the house and do chores. Teaching a child the importance of helping around the house isn’t always easy, and kids can easily forget what their new responsibilities are if they aren’t posted somewhere they will see them. Chore charts for kids can help both parents and children in so many ways. Download this printable chore chart to manage your kids chore duties. 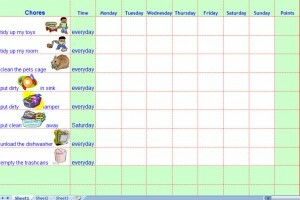 The childrens chore chart includes a point system and chores for each day of the week. Download this printable childrens chore chart for free here. This chore chart template is easy to use and will help teach the important lesson of responsibility. Simply print the colorful kids chore chart template and pick up some stickers while you’re out. Every time a chore is finished, children can put a sticker or mark the chore chart template for kids. This printable chore chart template is specifically designed to be simple and fun to use and understand. While it certainly helps teach kids the importance of staying on top of chores and keeping track of their time and responsibilities, this incredible kids chore chart template also has the added bonus of being fun for everyone involved to use. Download this chore chart template today and get started right away. Staying tidy and organized will be a blast when you download our chore chart template. If you love this template as much as our other users, please feel free to share this page on Facebook, Twitter or Google Plus. The chore chart is just another in our long line of templates, calculators and spreadsheets that are instantly downloadable and completely complimentary. I LOVE this chart!!!! This is perfect for our 3 kids so they have their own. I was gonna go to the store and buy all this stuff for a chart with stickers, but this was so much easier, (and a lot cheaper!) Thank you to whoever designed it! The other good thing is you can edit it however you want!